The former Decathlete, who won gold at the Beijing Olympics in 2008, is very adept at throwing the javelin, as it was one of the ten events that form his discipline. “It’s just kind of a tradition we have done since we were kids. I pulled my teeth out by tying the floss to the door handle and my wife has done things like that,” Clay told RT. He posted the feat on his Twitter feed, which was entitled, “what you use javelins for once you’re retired,” with the video showing his daughter, who at first, did not realize that her tooth was free. With family members scattered across the country and further afield, his mother was an immigrant to the US from Japan; he thought that posting it online would be a great way for relatives to have a look at what his family gets up to. “Today, with things like video cameras and cell phones, we thought, why not do something fun that we could send to our family members. We have done some creative things with the Javelin, we have just never thought of using it for dentistry,” he said. The 35 year-old had extensively researched his plan to make sure it was safe and was initially reluctant to carry it out. However, after reassurances from his wife, and “after my daughter nagged me and nagged me for a whole day,” Clay decided to give in. 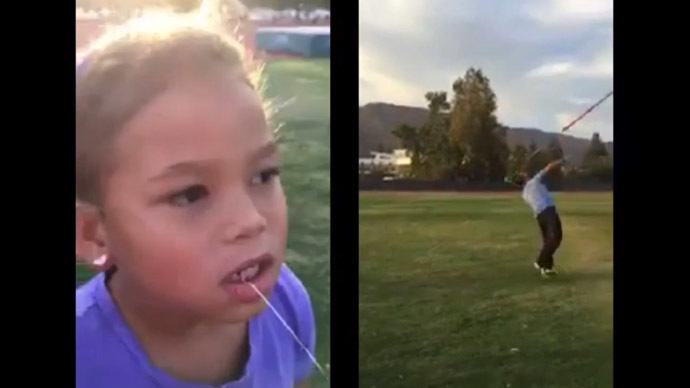 THIS GUY PULLED OUT HIS DAUGHTERS TOOTH WITH A JAVELIN! WHAT IS WRONG WITH PEOPLE WHY WOULD YOU TRY THAT WITH YOUR CHILD! Of course, not everyone could see that the Clay family just wanted to have a little fun and critics did take to Twitter to make their feelings known. “When you do things like that, people can always take it the wrong way. There is always that one person out there who would take it the wrong way, who might have thought my daughter was in a lot of pain, that we were being cruel or forced her to do it,” the former Olympic champion added. The smile on his daughter’s face was evidence enough that she certainly wasn’t in any pain, while it seemed as though she thoroughly enjoyed her father’s alternative attempts at dentistry. “It has been absolutely amazing and it was worth it,” Clay concluded. The only thing left for his daughter to do, was find the tooth, put it under her pillow and wait for the tooth fairy to come and leave its customary reward.